Does the name Boyan Slat ring a bell? There is a good chance it does. The now 22-years old engineer from the Netherlands decided to tackle the huge plastic waste problem in our oceans, after encountering more bags than fish in a scuba diving trip in Greece when he was 16. He came up with an invention to clean up the ocean’s garbage patches, an idea that soon would capture the attention of many after a video of his TedX talk in 2012 went viral. What the young inventor proposed is, by all means, ambitious – and in the eye of some oceanographers straight away insane. Nonetheless, in 2013 Boyan Slat founded a company to realise his idea: the Ocean Cleanup was born. After he revealed some major design changes and an updated timeline during an announcement event Delft, the Netherlands, earlier this month, it’s time to have a closer look at how this young fella thinks he will make it happen. Photo of the week: time for Ocean Cleanup! We humans are very effective in one thing: ruining all the good things the planet has to offer. On this blog we’ve talked a lot about air pollution and greenhouse gas emissions, but the air is not the only place we use as trash can. Every year millions of tons of plastic debris end up in our oceans. In the so-called Great Pacific Garbage Patch, with an estimated density of plastic of 330 000 parts per square kilometer, debris is brought together by the circular ocean current in the higher Pacific Ocean. Boyan Slat, now a 20-years old Dutch engineering student, presented an idea to clean up the mess a few years ago. At the time, it got a lot of publicity and with a kickstarter campaign he raised 2 billion dollars in no time. Last week, his ngo the Ocean Cleanup announced a first test system will be deployed in the second quarter of 2016 near Tsushima Island, between Japan and South Korea. 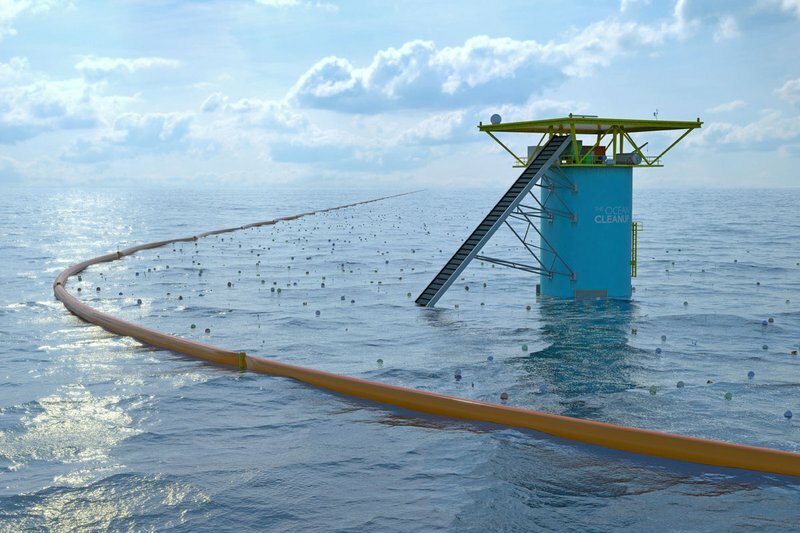 Within five years, after other deployments of increasing scale and design updates, Slat plans to deploy a 100 km-long system to clean up about half the Great Pacific Garbage Patch, between Hawaii and California. Altough many people are excited about the idea, not everyone is convinced the system is going to work. Back in 2014, a very thorough technical and scientific review of Slat’s own feasibility study was published. Besides the enormous technical challenges such a floating device poses to engineers, the Ocean Cleanup seems to aim at collecting the larger plastic debris at the top water layer. In fact, the most harmful are the tiny particles floating in lower water layers that are swallowed by sea animals. How the device will cope with this and other feasibility questions remain largely unanswered until today. Let’s hope the test system in Tsushima will bring clarity on what is possible. In the meantime, we better try to reduce our waste footprint anyway.